Born on December 27, 1822 in Dole, France, Dr. Louis Pasteur discovered that microbes were responsible for souring alcohol and came up with the process of pasteurization, where bacteria is destroyed by heating beverages and then allowing them to cool. His work in germ theory also led him and his team to create vaccinations for anthrax and rabies. French chemist and microbiologist Louis Pasteur was born on December 27, 1822 in Dole, located in the Jura region of France. He grew up in the town of Arbois and his father, Jean-Joseph Pasteur, was a tanner and a sergeant major decorated with the Legion of Honour during the Napoleonic Wars. An average student, Pasteur was skilled at drawing and painting. He earned his Bachelor of Arts degree (1840), Bachelor of Science degree (1842) and a doctorate (1847) at the École Normale in Paris. Pasteur then spent several years researching and teaching at Dijon Lycée. In 1848, he became a professor of chemistry at the University of Strasbourg, where he met Marie Laurent, the daughter of the university's rector. They wed on May 29, 1849, and had five children, though only two survived childhood. 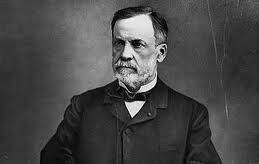 In 1854, Pasteur was appointed professor of chemistry and dean of the science faculty at the University of Lille. Here, he worked on finding solutions to the problems with the manufacture of alcoholic drinks. Working with the germ theory, which Pasteur did not invent, but further developed through experiments and eventually convinced most of Europe of its truth, he demonstrated that organisms such as bacteria were responsible for souring wine, beer and even milk. He then invented a process where bacteria could be removed by boiling and then cooling liquid. He completed the first test on April 20, 1862. Today the process is known as pasteurization. In 1865, Pasteur helped save the silk industry. He proved that microbes were attacking healthy silkworm eggs, causing the disease, and that the disease would be eliminated if the microbes were eliminated. Pasteur's first vaccine discovery was in 1879, with a disease called chicken cholera. After accidentally exposing chickens to the attenuated form of a culture, he demonstrated that they became resistant to the actual virus. Pasteur went on to extend his germ theory to develop causes and vaccinations for diseases such as anthrax, cholera, TB and smallpox. In 1873, Pasteur was elected as an associate member of the Académie de Médecine. In 1882, the year of his acceptance into the Académie Franaise, he decided to focus his efforts on the problem of rabies. On July 6, 1885, Pasteur vaccinated Joseph Meister, a 9-year-old boy who had been bitten by a rabid dog. The success of Pasteur's vaccine brought him immediate fame. This began an international fundraising campaign to build the Pasteur Institute in Paris, which was inaugurated on November 14, 1888. Pasteur had been partially paralyzed since 1868, due to a severe brain stroke, but he was able to continue his research. He celebrated his 70th birthday at the Sorbonne, which was attended by several prominent scientists, including British surgeon Joseph Lister. At that time, his paralysis worsened, and he died on September 28, 1895. Pasteur's remains were transferred to a Neo-Byzantine crypt at the Pasteur Institute in 1896.